Sometimes in life, we have to solve mysteries comparable to those found in Sherlock Holmes in his television version or in the novels. Cases hardly possible to solve that leave no visible traces that can point to a particular culprit. Clues, assumptions, and intuition: that’s all you have on hand to find the solution. In those moments is when you most reveal your ability to judge and you can notice the influence of your personality when making decisions. Today, Psych2Go want to present a very curious test in which you have no track beyond what you can see in the image. There is no definitive element that points the culprit once and for all. It all depends on what you see and what clues you note as determinants. You are the mother of the picture. Look at all your kids carefully in the picture. 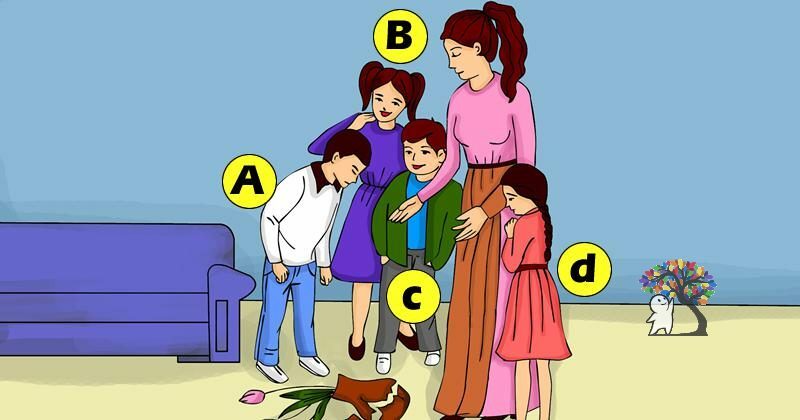 Which of the children has broken the vase? Who broke the vase? Check out your personality based on your judgment! I only picked child A because the mother wasn’t an option. she clearly looks like she was holding moments ago and dropped it.